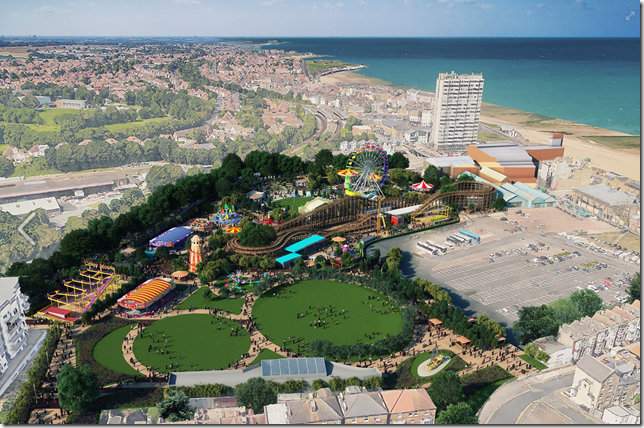 It’s been great to read the positive news stories coming out of Margate recently relating to the forthcoming Phase II development of the Dreamland site and the upcoming programme of events there this summer. From Hipsville to By The Sea festival and much more at last it seems HemingwayDesign’s original vision for Dreamland Margate is really starting to become reality and is being implemented after a couple of false starts. We documented our personal involvement in the project HERE. We hear from our pals down in Kent that the Old Town retailers are thriving, the arts community that initiated the resurgence in the town is still growing at pace and the media and public goodwill for Margate and Dreamland remains as strong as ever. The operational and financial difficulties have been well documented but we hear the Scenic Railway is up and running and additional funding is secured. It’s been the recent announcement of the Gorillaz headlined Demon Dayz festival that has really caught the public attention – a major coup for Margate! We think this summer will welcome an upturn in fortunes for Dreamland. Take a look at the full line-up of events and festivals HERE. Maybe it’s’ time to take one of our HemingwayDesign events down to Margate?